Here’s the official blurb: The time: 1936-1938. The mood: Hopeful. It wasn’t wartime, not yet. The music: The incomparable Count Basie and Benny Goodman, among others. The setting: Living rooms across America and, most of all, New York City. 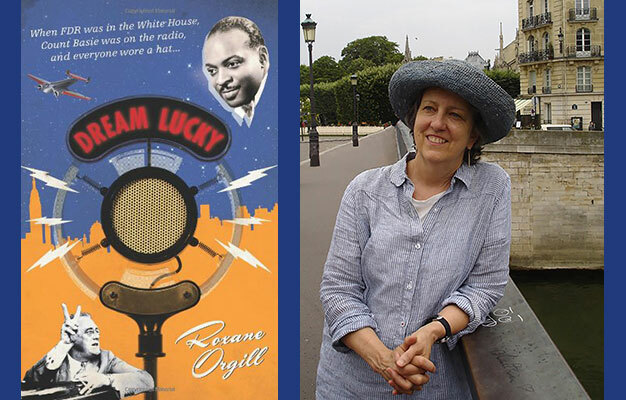 Dream Lucky covers politics, race, religion, arts, and sports, but the central focus is the period’s soundtrack—specifically big band jazz—and the big-hearted piano player William “Count” Basie. His ascent is the narrative thread of the book—how he made it and what made his music different from the rest. But many other stories weave in and out: Amelia Earhart pursues her dream of flying “around the world at its waistline.” Adam Clayton Powell, Jr., stages a boycott on 125th Street. And Mae West shocks radio listeners as a naked Eve tempting the snake. I admire Roxane Orgill as a writer, researcher, and weaver of history. This book is storytelling magic, and it’s all true! Her picture book, Jazz Day, is astounding as a melding of verbal poetry, visual poetry, and real people. Her writing is so evocative that I feel certain I lived alongside those people, stood in their locations, and had that awareness of what was happening around me. I am grateful for Roxane’s skill in crafting books that aid my understanding of the world. I’m going to read Dream Lucky again this weekend.